When we first mention to patients that we will put tape on them to help with their pain they look at us like we are a little crazy but, after the tape is put on they are amazed at how much better they feel. Rock Tape is an actual tape that the ChiroHealth & Rehab of Chiropractor Fargo experts place on the skin that acts like magic to get rid of pain. Anytime there is pain, the body will have a more difficult time not only moving but healing as well. That’s because healing is dependent upon proper movement. Applying Rock Tape is one of the most effective ways used by the doctors and team at ChiroHealth & Rehab to help get your pain down fast and your body moving again. Rock Tape actually turns down the volume on pain. More specifically Rock Tape interferes with the pain signals reaching your brain. Have you ever noticed that when you stub your toe or hit your head the first thing you do is rub that spot? Ever wonder why? Well, the reason for that is because the rubbing causing irritation on the skin which actually blocks pain signals from reaching your brain. So, the rubbing turns down the volume of pain the brain hears from the stubbed toe or the clunk on your head. That is basically one of the ways that Rock Tape helps ot relieve the pain almost instantly when it is applied to your skin. One of the first things the ChiroHealth & Rehab of Chiropractor Fargo experts will focus on will be to reduce your pain. There are a number of reasons this is important but one of the most important is so that you body can begin to move normally again without the pain. The reason this is so important is because movement will help your body begin the healing process much more quickly than if you continue to move in a limited fashion because of pain. What Rock Tape does and the reason the doctors and care team at ChiroHealth & Rehab use Rock Tape is to help decrease the amount of pain your brain is sensing from the area that you have a problem with. So, the ChiroHealth & Rehab of Chiropractor Fargo experts know that the sooner you can the area that hurts moving more normally, the faster your body is able to heal. But, you don’t feel like moving something when it hurts, do you? Of course not! 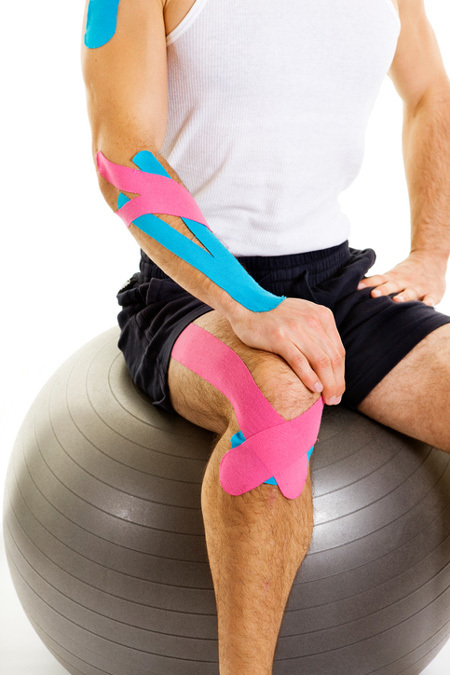 Nobody likes to move when they have pain and that is why the doctors and care team us Rock Tape as a way of getting your body to move more with less pain in order that your body can heal more rapidly. Again, the way Rock Tape works is much like after rubbing your head when you bump it. The rubbing blocks pain and so you feel less pain. When the ChiroHealth & Rehab of Chiropractor Fargo experts apply Rock Tape on the skin it acts just like when you rub your head and actually interfere with and blocks painful signals from reaching the brain. Very simply, when pain signals are blocked from reaching the brain, you do not feel as much pain and and then you are able to move more easily with much less pain. This allows for better circulation, better tissue healing, better joint healing, and faster recovery. Its just like magic! Another reason the chiropractors in Fargo at ChiroHealth & Rhab use Rock Tape is that when applied correctly, it actually has a microscopic lifting effect on the skin. This “lifting” of the skiin causes the areas underneath the skin and in the different layers under the skin to be raised. This is important because raising the skin above the areas underneath it allows all of the inflammation and toxins to be removed more quickly. This is because it actually decompresses and opens up the small vessels in that area that are responsible for removing inflammation and toxins. When there is inflammation those small vessels get squeezed. You know how when a hose is squeezed and the water can’t flow through it? That’s exactly what happens to the small vessels that are supposed to get rid of the inflammation, they can’t and so the inflammation and toxins causes more pain and damage. Your ChiroHealth & Rehab of Chiropractor Fargo experts know that the sooner the inflammation is removed, the faster you feel better and the more quickly you can heal. Rock Tape will allow for those small vessels to be opened up and the body can then get rid of the inflammation and toxins that otherwise would build up. Believe it or not, but Rock Tape also helps prevent your muscles from tiring out too quickly. If your muscles tire out too fast it can actually slow down your healing process. That is why the ChiroHealth & Rehab of Chiropractor Fargo expert will recommend the use of the Rock Tape when necessary to help you recover faster. During the rehabilitation process one of the things that slows down the recovery process is that muscles tire out and fatigue very quickly. This limits the ability of your body to do the proper movements that it needs to do in order to heal more rapidly. When the Chiropractor Fargo expert applys Rock Tape during your rehab therapy, it benefits not only to the parts of your body that are hurting but also the surrounding areas as well. This is because muscles near the areas that hurt will pick up the slack for weak and painful muscles and will do too much work and, as a result, your whole body will fatigue too quickly. The Rock Tape help to comfort and support those muscles to prevent them from tiring out too fast and slowing down your healing. When the Rock Tape is applied to the areas that we are trying to rehabilitate, your body is able to perform the rehabilitation movements much more completely and much more accurate. The reason this is important is because this allows for your body to go through more movement with less pain which increases healing time and helps to prevent future injury. Another reason the ChiroHealth & Rehab of Chiropractor Fargo expert uses Rock Tape is that it also helps to normalize something called “muscle tone and coordination”. What exactly is that and why is it important? Well, when there’s injury or pain, your body’s ability to usemany muscles in unison to create proper and efficient movement doesn’t happen normal. What this causes is a greater level of stress and wear and tear on muscles because some have to overwork while others don’t work hard enough. This leads to improper movement of your body and you have to use up more energy just to do your everyday tasks. Want to know the even stranger part? These changes can happen in areas seeminly not even connected to the area that is injured or is hurting. For example, research is showing the people who sprained their ankle tend to have altered activity of the hip muscles as a result which, believe it or not, can actually lead to changes in the lower back and ultimately pain in your back mid-back, and neck all as a result of having a sprain ankle! When the chiropractor of Fargo at ChiroHealth & Rehab apply Rock Tape, it can help bring muscles that would otherwise stop working come back to life AND, can help calm down the overworking muscles. What this means to you is that your body is better able to coordinate movements and make movements more normal as if it wasn’t hurt, allowing your body to heal more quickly and more completely. Overall, the use of Rock Tape by your chiropractor of Fargo at ChiroHealth & Rehab is one of the most effective ways of getting your pain to reduce quickly and allow your body to move normally which means getting you on the path to recovery faster as well as helping to prevent your pain from coming back in the future. Give us a call today at 701-451-9098 to see if Rock Tape can help you get out of pain and stay that way!